The Kooiker tends to be a fun and energetic companion. Yes, you read that right. 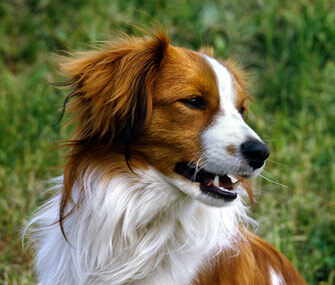 A Kooikerhondje. What’s that, you ask? The Kooiker, as he’s known for short, is a Dutch sporting breed (his full name is Nederlandse Kooikerhondje) whose job is to lure ducks into a trap for banding or retrieval by a hunter. His size, appearance and generally happy nature make him beloved by the people who are in on the secret of his existence. Here are some fun facts about the Kooiker to help you decide if he’s the right dog for you. He’s not too big and not too small. For most people, the Kooiker’s size is just right. The breed tends to be 14 to 16 inches tall at the shoulder and typically weighs 20 to 30 pounds. Many are lap dogs who love to cuddle and usually won’t squash you. The Kooiker tends to be a fun and energetic companion for people who love the outdoors. Whether you enjoy flipping a flying disc for a dog to chase, going hiking or getting wet in the surf, a Kooiker is likely to be a good partner (barring any physical conditions that would prevent this). Generally, the breed is known to excel at many different dog sports, including agility, barn hunt, dock diving, nose work, rally and tracking. Fetching tennis balls is a common passion. The Kooiker often loves water and many will happily swim with you in any body of water or maybe hop on your standup paddleboard to go for a ride. Need a first mate on your boat? The Kooiker is probably your man, er, dog. He has been described as a dog who never grows up, often staying playful well into his senior years. Well, not gold ones, but the flashy black tips on his ears are called earrings. They are an essential and attractive element of his overall look: orange patches on a white, medium-length double coat with feathering (fringe) behind the ears and on the legs. A plumy white tail often wags enthusiastically. The Kooiker is known for loving his people. He’s often fond of kids and, with appropriate socialization and supervision, many can make great playmates. Kooikers tend to be devoted companions, always sticking close by and eager to bring you joy and happiness. He’s not a dog who will be happy if left on his own all the time. The Kooiker often learns quickly, though he may have an independent streak so training sometimes needs to be an ongoing process. Kooikerhondjes will typically notice anything different and alert you to it. But beware: The Kooiker’s intelligence can also mean that he’s not necessarily the right dog for everyone. It’s easy for him to wrap you around his paw and get his way. If you’re a pushover, you might want to choose a different dog.